Usually if you bend your body during the middle of an exercise, it can mean that your lifting too much weight. However, with deadlifts this can give you a new maximum lift. If you train yourself to almost fall backwards when performing a lift, you can position your body to produce more power for your lift. 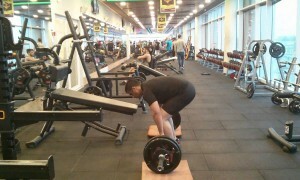 Many professional lifters use this technique to hit and exceed their maximum lift weight. You should stand with the bar at your feet in the same kind of position as you would perform a jump you should keep your back in a natural arching position. Then reach down and grab the bar with your hands roughly a shoulder width apart. Ideally your shoulders will be directly over the bar or maybe slightly behind the bar and you should be looking straight ahead. The technique now is to rock back onto your heels so that you become slightly off-balance. As you push your feet into the floor, you begin the pull and you should be feeling as though you’re falling backwards little. When you get the point when the bar is past your knees, you should move your head back so your chin points upwards. You may stumble a little during warm ups when using a lightweight, but once you move onto the heavy weights for your proper lifts, the weight acts to balance you. Most beginner and intermediate differences will try to pull the bar directly upwards when in fact they should be thinking about pulling it upwards and backwards too. By adjusting your centre of gravity back, the hamstrings and glutes are placed in a more powerful position. This allows them to extend the hips easier. By practising this simple technique you will have achieve a new maximum lift and also a stronger lift. When this is combined with a good weight lifting belt, your max lift will go through the roof!